Forefoot pain is one of the most common presenting problems in a foot and ankle practice. One of the most common presenting problems, yet most commonly missed problems, is a plantar plate tear. Often the problem is considered to be potential neuroma, fat pad atrophy, or a generalized diagnosis of metatarsalgia or metatarsal head overload. Unfortunately, not enough attention is placed on the plantar and medial/lateral ligamentous structures of the metatarsal-phalangeal joints (MPJ). This lack of attention results in poor diagnosis, lack of care, treatment for the wrong condi- tion, and ultimate frustration for the patients and doctor. Although the actual cause of plantar plate injury may be from multiple reasons, the most common causes are associated with chronic repetitive mild overload or acute traumatic overload. Deland and colleagues performed cadaveric studies and deter- mined that transverse deviation or crossover toes were associated with an abnormal position of the long and short flexor tendons on the involved foot versus central posi- tion of the flexor tendons in the uninvolved foot. [5,7] Although any MPJ can be injured, the most common injury is associated with the second MPJ. The frequency of second MPJ plantar plate injury may be caused by inflammation and pain from overload secondary to first ray hypermobility and hallux abducto valgus causing overload of the second MPJ. A long second metatarsal, short first metatarsal, forefoot varus, forefoot overload secondary to equinus deformity, neuromuscular imbalance, and systemic or inflammatory arthritidies have also been common sources for plantar plate injury. Although all of the previously mentioned sources have been found by the authors, it is still unclear why the problem occurs in some patients and not others with similar conditional findings. Subsecond metatarsal pain can be difficult to diagnose. Common findings that must be ruled out include capsulitis, synovitis, lesser metatarsal stress fracture, Freiberg’s infarc- tion, second interspace neuromas, inflammatory arthropathy, degenerative joint disease, or simple joint overload. Commonly, patients will present with a generalized forefoot swelling and most local pain in the associated joint. If the treating physician is not careful, they may confuse the pain in the MPJ with interspace pain. In the second MPJ, the pain is most commonly plantar and lateral, which can easily be confused with a neuroma. There may be an associated hammertoe deformity that is caused by the weakness of the plantar ligamentous structures resulting in a flexor and extensor imbalance. It is essential to not get confused with the cause of MPJ pain being from the hammertoe contracture as missing the plantar plate tear and just correcting the hammertoe is destined for failure. A keratotic lesion under the associated metatarsal is rare in plantar plate tear cases and is more commonly associated with a hammertoe contracture that is causing symptomatic retrograde metatarsal head pressure. Probing patients for type of pain and associated timing of pain is critical for differential. Most patients with plantar plate pain do not complain of sharp shooting or tingling pain. The pain is commonly a dull ache with ambulation, chronic in nature, and better with a stiff shoe and cushioning. Patients will also suggest that the pain is fairly consistent and not different with differing activity. As the plantar plate tear advances, patients will suggest a medial shift in their toe position and gapping from the lateral toes. This finding is most common on the second toe, which moves medial and dorsal toward the great toe. Clinically you can evaluate second MPJ sagittal plane instability with the modified Lachman test, or the anterior/dorsal drawer test, originally described by Thompson and Hamilton and Thompson and Deland. [8–10] Although difficult to judge, a noted sign of plantar plate tear in the literature has been a dorsal drawer of more than 2 mm or 50% or greater dorsal displacement. [4,11] It should be noted that false positives can result in patients with ligamentous laxity. Another widely accepted maneuver evaluating the integrity of the MPJ is the Kelikian push-up test that evaluates the relative reducibility of the deformity by pushing or loading the plantar metatarsal head to see if the toe will reduce or straighten out. In cases of a normal to slight hammertoe deformity with a torn, plantar plate, there is medial deviation of the toe with a Kelikian push-up test. Patients will also complain of pain with plantar pressure on the region of plantar plate tear. Radiographs are important to rule out other osseous etiologies, such as acute fractures, stress fractures, Friedberg’s infarction, arthritic changes, appropriate evaluation of the metatarsal parabola, and overall MPJ alignment. Furthermore, a combination of mostly plantar soft-tissue pain, with possible instability on physical examination, and radiographs negative for gross osseous pathology can be sufficient for plantar plate injuries. However, further imaging studies can help confirm diagnosis and also rule out other etiologies. The two most common imaging studies are arthrography and MRI. Because the plantar plate is continuous with the flexor sheath, some investigators considered arthrography as the gold standard and diagnosis is confirmed with extravasation of the dye from the joint into flexor sheath. A study by Yao and collogues1 in 1996 demonstrated that all 5 subjects diagnosed with plantar plate tears by MRI were confirmed by intraoperative findings. They diagnosed plantar plate tears that demonstrated “increased signal intensity in the plantar plate that extended beyond the immediate area of plantar attachment on the proximal phalangeal base.on the gradient-recalled images. The use of ultrasound can also aid in the diagnosis, but the availability and user dependence can make the procedure difficult. One advantage of ultrasound is that it can a dynamic and the operator can move the toe, as well as compare with other toe plantar plates for difference. An abnormal plantar plate demonstrates a loss of homogenicity with focal areas of hypoechoic defects. Each practitioner will try different conservative modalities but should attempt a variety of conservative measures before surgical procedures. Common conservative treatments include but are not limited to the following: shoe gear modification, accommodative or functional orthotics with appropriate metatarsal pad or metatarsal head cut, soft insoles, elimination of high-heeled shoes and sandals, activity modifications, taping and strapping of toe, ice, physical therapy with anti-inflammatory modalities, oral nonsteroidal antiinflammatory drugs (NSAIDS) or steroids, and possibly steroid injections. If conservative measures fail to relieve symptoms, then there has been a variety of surgical procedures described in the literature. What the authors have found to work on a conservative basis includes a stiff-soled rocker-sole shoe that decreases the roll-off phase of push off. Taping the toe in a plantar position has also been found to decrease dorsal movement of the toe and relieve pressure on the plantar metatarsal head. Orthotic use can be an excellent source of pain relief and also may be used after surgical care to control pressure distribution. In most cases, a metatarsal head cutout is performed. The second metatarsal head is the most commonly affected and therefore a second metatarsal head cutout is the most commonly performed. If the second metatarsal head is affected because of hypermobility of the first ray or hallux valgus deformity, a stiff extension under the first ray to the distal toe is used to improve pressure distribution under the first metatarsal area. A metatarsal pad can also be used to relieve generalized forefoot pressure and move some of the weight to the mid metatarsal area. If high heels are necessary in the patients’ lifestyle, it is recommended that they wear a wedge-type shoe that has a stiff sole and thick forefoot. This type of shoe decreases forefoot pressure and also decreases the heel height as the forefoot also has height. Physical therapy and NSAIDS can be useful to calm the inflammation, but control of MPJ overload is the critical portion of conservative measures. Of interest is the idea of the potential use of materials, such as platelet rich plasma (PRP) and short-term cast immobilization, to decrease stress on the MPJ and increase local inflammation in an attempt to allow the ligament to heal. This method has been attempted at the authors’ institute several times on older patients with little high-stress use on the MPJ region with moderate relief. Combined with orthotic use, these patients have been able to perform their normal life activity with little to no pain. To date, the authors have not tried PRP therapy of plantar plate tears in active patients. In cases that do not improve with conservative care, surgical reconstruction is attempted. It is important to understand the underlying causes of plantar plate injury when dealing with any deformity to address the primary and secondary deforming forces. This article focuses on repair of an isolated pathology of plantar plate injury and toe defor- mity. Accordingly, if there are concomitant pathologies, such as severe hallux valgus, laxity at the metatarsocuneiform joint causing abnormal peak pressures of lesser MPJs, or equinus deformity, they must be addressed conservatively or surgically to prevent recurrence. There have been a variety of ways to surgically correct the deformity presented in the literature and are briefly described. In 1938 Lambrunidi advocated straightening the toe by performing a proximal interphalangeal (IPJ) arthrodesis to allow the long flexors to only act at the MPJ. Over time, a flexor-to-extensor transfer procedure was added to secondarily stabilize the torn plantar plate and associated MPJ. Flexor tendon transfers were first described in the literature in 1947 by Girdlestone in which he transferred the long and short flexor tendons into dorsal expansions of extensor tendons for claw-toe deformities. The objective of this procedure was twofold: (1) to allow the long flexors to substitute for intrinsic muscle weakness by providing plantarflexion of the toes at the MPJ, and (2) to release the plantar contracture at the distal toe allowing extension of the toes at the IPJs. This finding was also supported by Taylor in 1951 when he evalu- ated the benefit of transferring the flexor tendon into the extensor tendons as well as extensor digitorum longus lengthening and dorsal capsulotomies at the MPJ, and plantar capsulotomies at the IPJs in the treatment of claw toes. Taylor described that with toe deformity/contracture, the intrinsic muscles lost the function of flexing the toes at the MPJ level and now the forces were increased at the plantar metatarsal heads. Furthermore, he found that the integrity of the intrinsic muscles were mostly found to be intact and have normal-appearing anatomy. In 1951, Pyper did a follow-up study and compared the Lambrunidi and Taylor procedures and found only subtle differences between the two procedures. In 1973 Parrish described flexor tendon transfer for the reducible claw-toe deformity by harvesting the long flexor tendon that was split longitudinally at the level of the MPJ and then the each half of the tendon is wrapped around the midportion of the proximal phalanx and the ends are sutured together underneath the extensor tendons. Parrish found good-to-excellent results in 20 out of 23 subjects. In 1980, Kuwada and Dockery described a modification to eliminate the MPJ and IPJ capsulotomies procedures in which they transferred the long flexor tendon to the dorsal side at the anatomic neck of the proximal phalanx through a drill hole and sutured into the dorsal capsule and soft tissue. In 1984, Barbari and Brevig, reevaluated the success of the flexor-extensor transfer procedure for claw-toe deformities, in which they harvested the long flexor tendon and then sutured it end-to-side to the extensor tendon. They found good-to-excellent outcomes with the procedure. Ross and Faux8 described good-to-excellent results in 96% of subjects undergoing a dorsal approach using a combined long extensor Z lengthening, proximal phalanx arthroplasty, and a long flexor tendon transfer. One of the main problems with these procedures is the well-known and accepted postoperative stiffness. In 1993, Thompson and Deland evaluated this and found that no subject that could perform at least 20 of dorsiflexion experienced postoperative stiffness. They emphasized removal of the stabilizing k-wire at about 2 to 3 weeks and encouraged toe range of motion equal to adjacent toes. A cadaveric study by Ford and colleagues in 1998 demonstrated that primary anatomic direct repair of plantar plate is as viable as flexor tendon transfer for trans- ected plantar plate. Some investigators advocate that only isolated plantar plate repairs are indicated for reducible MPJ contractures, and that only nonreducible deformities require additional procedures. In 2005, Shurnas and Sanders[2 ]described a combination of procedures, including oblique osteotomy of metatarsal, extensor lengthening with hammer toe repair, as well as flexor tendon transfer to the dorsal aspect of proximal phalanx fixated with a bio-tenodesis screw. They found excellent outcomes and minimal stiffness associated with this combination of procedures. Plantar plate treatments have become one of the most presenting problems in the authors’ institutes. The authors have performed several hundred cases of plantar plate tear and noted that each case is different and requires different treatments. In general, the factors causing pain may differ and all of the factors must be considered for an excellent outcome. As noted earlier, hallux valgus problems, equinus and secondary causes of pain must be addressed and treated but will not be further discussed in this article. This article concentrates on the plantar plate tear and associated ray in explaining the authors’ surgical techniques. The first problem to consider is whether there is a hammertoe associated with the deformity. If there is a hammertoe, the type of plantar plate transfer differs. If we perform a hammertoe correction, we will attempt a proximal IPJ fusion with a cup and cone technique. We will try to remove minimal bone from the proximal IPJ region to avoid shortening of the toe and allow better bone contact for the IPJ fusion. The type of tendon transfer performed in association with a hammertoe correction is a split flexor to extensor transfer around the base of the proximal phalanx and k-wire fixation of the fusion and MPJ joint. If there is minimal hammertoe deformity, patients are given the option of if they would like the toe corrected and if the toe bothers them in shoes. If no hammertoe is associated with the plantar plate tear, the flexor-to-extensor transfer is performed with an interference-screw technique through the proximal phalanx base. In such a case, a dorsal-MPJ incision is made extending to the dorsal base of the proximal phalanx. The long flexor tendon is harvested through a small plantar incision at the distal IPJ. The tendon is then passed through a drill hole from plantar to dorsal in the proximal phalanx base with the use of a suture passer and tensioned. Once proper toe position and flexor tension is achieved, an interference screw is used to stabilize the transferred tendon. In both cases, the dorsally transferred tendon can be used to tie into the lateral ligamentous structures to perform a plication of the loose ligaments resulting in medial deviation of the toe. Primary repair of the plantar plate is not per- formed at the authors’ institute and has been noted to not stand up over time and to be difficult to perform when cadaveric studies have been attempted by the surgeons at the authors’ institute. However, the MPJ joint is opened and the plantar plate is inspected. If the tear is visible, which is common, a Topaz probe is used to fenestrate the plantar plate in an attempt to stimulate scar formation and added stability during the recovery period. Ligament plication techniques of the lateral collaterals have also proven to be helpful for toe positioning. This technique is either performed by a pants-over-vest plication with nonabsorbable suture or with an anchor. The decision of suture versus anchor is made based on whether the soft tissue is torn off bone or centrally. If there is adequate soft tissue for pants-over-vest plication, an anchor is not deemed neces- sary. If the soft tissue is torn off bone, a small anchor is used to pull the soft tissue back to bone with a nonabsorbable suture. The final consideration of surgery is whether or not to perform a metatarsal head shortening. This procedure may be simple and the idea of decreasing pressure on the second metatarsal head seems legitimate, but care must be taken to avoid shortening the ray and causing transfer lesions or pain. The decision is based on whether there is overload of the ray from a primary or secondary cause. For example, if there is a hallux valgus deformity causing second metatarsal overload, the hallux valgus deformity is corrected and then second metatarsal length is checked. We will not correct the second ray length without correct the hallux valgus deformity, which is considered the primary source of overload. That said, there is commonly a problem with a long metatarsal associated with plantar plate injury and shortening may be necessary. The second metatarsal is the most commonly affected ray and is shortened, leaving it just slightly longer than the third metatarsal. Overshortening of the second metatarsal will cause continued forefoot pain and transfer metatarsalgia under the surrounding metatarsals. The preferred type of metatarsal osteotomy we prefer to perform is a Weil-type osteotomy. This osteotomy allows for proper control of metatarsal shortening and length and is adjustable for proper positioning during surgery and is also simple and stable to fixate. For example, the metatarsal length is checked under fluoroscopy and can be adjusted to the desired position and readjusted as necessary before permanent fixation. The metatarsal can also be translated medially to move the phalanx laterally if there is a medial deviation of the ray. A metatarsal osteotomy is performed before flexor tendon transfer to avoid a slack tendon transfer. Once correction is achieved, patients are placed in a protective postoperative boot and heel weight is allowed. If a k-wire is not used and hammertoe correction is not neces- sary, the toe is splinted in a plantar position with the dressings to avoid dorsal stress and potential flexor tendon pullout. Pullout of the flexor tendon has not been seen with interference-screw fixation. The k-wire is left intact for 6 weeks and then pulled. We have not found stiffness of the metatarsal to be a common complaint and think it is essential to avoid overtightening of the flexor tendon transfer to avoid MPJ stiffness. If no k-wire is used, therapy is started at 4 weeks with passive range of motion and toe strengthening. If a k-wire is used, patients are referred to therapy after wire removal. It is critical to use therapy to strengthen the transferred tendon and get the surgical toe to purchase the ground. Patients not treated with home therapy or physical therapy often end up with toe purchase weakness, which is a common source of complaint. Range of motion of the MPJ is also performed in therapy as is gait work to avoid abnormal ambulation patterns after surgery. Our outcomes with this combination of surgical procedures have been excellent. The rate of complication is low and no nerve issues have been noted with tendon flexor tendon transfer in 268 cases in the past 7 years involving more than 300 toes. The most common procedure performed is a proximal phalanx IPJ fusion with side-to-side flexor tendon transfer and capsule plication. A metatarsal osteotomy was performed in 87% of subjects in association with tendon transfer. Only 7% of subjects had secondary plantar plate repair with interference screw fixation. The most common postoperative complaint was a nonpurchasing toe in 6% of subjects. All such cases involved a metatarsal osteotomy and hammertoe correction. These cases required a dorsal soft-tissue release in 3% of subjects, which resolved complaints in all cases. The other 3% of subjects improved with time and therapy. With time, the flexor tendon transfer with made slightly tighter in cases of metatarsal osteotomy and the case of toe purchase was found to be significantly improved. No cases of MPJ stiffness were noted as a subject complaint. Plantar plate pain was present after pin removal for about 4 months after surgery but resolved in 98% of subjects. Revision surgery was not necessary in any subject. Postoperative pressure control was performed with an orthotic in most subjects to avoid further trauma to the forefoot and protect the surgical site. Subjects were told to use the orthotic device for a minimum of 1 wear with stiff shoes and then to use the orthotic device as much as possible in the long term. Women requiring high-heel use were allowed high heels at 3 months after surgery but were told to use a stiff wedge-type shoe with a back strap for 6 months after surgery. Plantar plate tears are a far more common problem than noted. Often this problem is confused with a neuroma or hammertoe deformity and commonly mistreated. A dorsal drawer test, medial shift of the toe, and plantar capsular pain are the most indicative diagnostic signs. MRI and ultrasound diagnosis are commonly used to confirm a suspected problem. Strapping of the toe and stiff shoes with orthotics are common conservative treatments but offer limited improvement. Surgical procedures include flexor tendon transfer, hammertoe correction, ligament plication, and metatarsal osteotomy; each case must be judged separately for best outcome. Postoperative protection is necessary for 4 to 8 weeks in a below-the-knee walking boot followed by aggressive physical therapy. Toe purchase issues are more common in cases of hammertoe correction and metatarsal osteotomy; this issue is improved with a slight increased tightening of the flexor tendon transfer. It is essential to consider this problem as part of the differential diagnosis in cases of suspected second interspace neuroma and in any case of hammertoe formation without MPJ keratoma. With proper patient selection, adequate workup, and surgical planning, this common problem is fairly easy to treat with excellent outcomes. The authors’ results showed patient satisfaction in more than 95% of cases and minimal operative complications. 1. Yao L, Cracchiolo A, Farahani K, et al. Magnetic resonance imaging of plantar plate ruptures. Foot Ankle Int 1996;17:33–6. 2. Shurnas P, Sanders A. Second MTP joint capsular instability with clawing defor- mity: metatarsal osteotomy, flexor transfer with biotenodesis, hammer toe repair, and MTP arthroplasty without the need for plantar incisions. Tech Foot Ankle Surg 2005;4(3):196–201. 3. Marks RM. Anatomy and pathophysiology of lesser toes deformities. 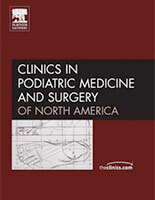 Foot Ankle Clin 1998;3:199–213. 4. Blitz N, Ford L, Christensen J. Plantar plate repair of the second metatarsopha- langeal joint: technique and tips. J Foot Ankle Surg 2004;43(4):266–70. 5. Deland JT, Lee KT, Sobel M, et al. Anatomy of the plantar plate and its attach- ments in the lesser metatarsal phalangeal joint. Foot Ankle Int 1995;16(8):480–6. 6. Johnston R, Smith J, Daniels T. The plantar plate of the lesser toes: an anatomical study in humans. Foot Ankle Int 1994;15(5):276–82. 7. Deland JT, Sung IH. The medial crossover toe: a cadaveric dissection. Foot Ankle Int 2000;21(5):375–8. 8. Ross SD, Faux JR. Surgical treatment of the unstable lesser metatarsophalangeal joint. Tech Foot Ankle Surg 2004;3(2):106–12. 9. Thompson FM, Hamilton WG. Problems of the second metatarsophalangeal joint. Orthopedics 1987;10:83–9. 10. Thompson FM, Deland JT. Flexor tendon transfer for metatarsophalangeal instability of the second toe. Foot Ankle 1993;14:385–8. 11. Bouche RT, Heit EJ. Combined plantar plate and hammertoe repair with flexor digitorum longus tendon transfer for chronic, severe sagittal plane instability of the lesser metatarsophalangeal joints: preliminary results. J Foot Ankle Surg 2008;47(2):125–37. 13. Lambrunidi C. The feet of the industrial worker. Functional aspect: action of the foot muscles. Lancet 1938;II(1):480. 14. Kirchner JS, Wagner E. Girdlestone-Taylor extensor tendon transfer. Tech Foot Ankle Surg 2004;3(2):91–9. 15. Taylor RG. The treatment of claw toes by multiple transfers of flexor to extensor tendons. J Bone Joint Surg Br 1951;3(2):539–42. 16. Pyper JB. The flexor-extensor transplant operation for claw toes. J Bone Joint Surg Br 1958;40:528–33. 17. Parrish TF. Dynamic correction of claw toes. Orthop Clin North Am 1973;4: 97–102. 18. Kuwada GT, Dockery GL. Modification of the flexor tendon transfer procedure for the correction of flexible hammertoes. J Foot Surg 1980;19:38–40. 19. BarbariSG,BrevigK.CorrectionofclawtoesbytheGirdlestone-Taylorflexor-extensor transfer procedure. Foot Ankle 1984;5:38–40. 20. Ford LA, Collins KB, Christensen JC. Stabilization of the subluxed second meta- tarsophalangeal joint: flexor tendon transfer versus primary repair of the plantar plate. J Foot Ankle Surg 1998;37(3):217–22.